The Kirkuk status referendum was the Kirkuk part of a planned plebiscite to decide whether the disputed territories of Northern Iraq should become part of the Iraqi Kurdistan region. The referendum was initially planned for 15 November 2007, but was repeatedly delayed and ultimately never took place. The referendum was mandated by Article 140 of the Constitution of Iraq. Article 140 required that before the referendum, measures had to be taken to reverse the Arabization policy employed by the Saddam Hussein administration during the Al-Anfal Campaign. Thousands of Kurds returned to Kirkuk following the 2003 invasion of Iraq. The referendum was to decide whether enough had returned for the area to be considered Kurdish. Kurdish resentment over the government's failure to implement Article 140 was one of the reasons for the 2017 Iraqi Kurdistan independence referendum, which posed the question, "Do you want the Kurdistan Region and the Kurdistani areas outside the Region to become an independent state?" The referendum led to episodes of Iraqi–Kurdish conflict and the government takeover of Kirkuk. Disputed and part of the Kurdish Regional Government since 1991. Disputed and in part under the control of central government, although this area has diminished since the events of 2014. In late 2007, the U.N. Special Representative for Iraq negotiated an extension of the deadline for six months. However, the federal parliament decided to refer the matter to the Constitutional Court to rule whether the article was now expired or how it should be implemented. Najat Hassan Karim, senior Kurdish politician. The government of Nouri al-Maliki appointed a "Commission on the Normalisation of the Status of Kirkuk" to implement the de-arabization program. The Justice Minister, Hashim Abderrahman al-Shibli, a secular Sunni Arab from the secular Iraqi National List coalition was appointed the head. A program of normalisation was to be followed by a census by July 2007 and a referendum in November 2007. In April 2007, Turkish intelligence sources claimed that Kurdistan President Barzani had "offered bribes to various Iraqi officials" involved in the Commission, including $500,000 to al-Shibli. Turkey claimed that Iraqi Kurdistan was planning to annex Kirkuk "illegally", and that the rights of Iraqi Turkmen would be violated if Kirkuk joined Iraqi Kurdistan. Shibli resigned as head of the Commission in March 2007, citing disagreements with his own coalition on Kirkuk. Raed Fahmy Jahid, another Sunni Arab from the INL was appointed his replacement in August 2007. In February 2007, the Commission adopted a controversial plan, which gave Sunni Arabs $15,000 to relocate back to their towns of origin, plus a plot of land in their new home. In September 2007, it was reported that the normalization program had been bogged down in technical difficulties. The Kurdish parties were reported to have agreed a delay to the timetable for the census and referendum. The Sadrist Movement called for the referendum to be postponed in June 2007. Supreme Islamic Iraqi Council: In July 2007 they were reported to have supported a delay. The Iraqi National Dialogue Front called for a delay in June. Saadeddin Arkej, the leader of the Iraqi Turkmen Front said in June that they aimed to save Kirkuk as the capital of Iraqi Turkmens or at least earn it a special status. Turkey – The Turkish government strongly opposed holding of the upcoming referendum in 2007, calling for it to be postponed. Iraqi Deputy Prime Minister Barham Salih said in a statement posted on the internet on 9 December 2006, "The issue of Kirkuk will be resolved in accordance with the Iraqi Constitution Article 140. Consequently, this constitutional question will be resolved by the Iraqis themselves. No one can interfere in that." On 10 December, in a speech made at the International Institute of Strategic Studies in Manama, Bahrain, Turkish Defense Minister Vecdi Gonul warned the Iraqi government against imposing an "unrealistic" future on Kirkuk. Iraqi Foreign Minister Hoshyar Zebari criticized Gonul, saying, "You speak of Kirkuk as if it is a Turkish city. These are matters for Iraq to decide." United States – The Iraq Study Group of senior American politicians recommended that the referendum be delayed "to avert communal violence given the very dangerous situation in Kirkuk". Iran – Iran called for a delay of two years for political reasons in early November 2007. Saudi Arabia – Saudi Arabia reportedly offered the Iraqi Kurdish leaders $2 billion in exchange for delaying the process for ten years. 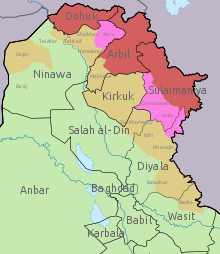 In June 2008 the UNAMI head, Staffan de Mistura recommended that the Akra District of Ninawa Governorate and the Makhmur District of Kirkuk Governorate be incorporated into Kurdistan but that the al-Hamdaniya area of Ninawa Governorate and the Mandali area of Diyala Governorate be excluded. These recommendations were rejected by the Council of Representatives of Iraq. ^ Iddon, Paul. "Iraqi Kurdistan in disarray after the loss of Kirkuk". alaraby. Retrieved 31 October 2017. ^ "President of Iraqi Kurdistan says independence vote is due to failure of unity". The National. Retrieved 31 October 2017. ^ "Kurdistan referendum commission reveals four-language sample ballot". Rudaw. Retrieved 31 October 2017. This page was last edited on 12 March 2019, at 19:46 (UTC).